I just don't know anyone who is a greater pleasure to work with or any company that produces such beautiful work so promptly. While Brian Gavin strives to maintain one of the largest in-house inventories of super ideal hearts and arrows diamonds, it is impossible to stock every combination of carat weight, color, and clarity. For one thing, the supply of rough diamonds is constantly changing. The good news is that you don’t have to wait, and wait, and wait, for the diamond you are looking for. 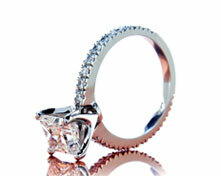 You can simply order the diamond you want, custom cut to order from the factory. While this might seem a daunting proposition at first, keep in mind that the alternative is to cross your fingers (and perhaps your toes) and wait for the diamond of your dreams to come along. And then hope that somebody else doesn’t grab it before you do… There is a long list of people waiting for specific combinations of carat weight, color, and clarity. Given the fact that we are continually producing diamonds in large volume, the odds are that something will eventually come along to tempt you with. But if you want to guarantee that you get the diamond you are looking for in relatively quick order, then we suggest initiating an order for the diamond to be custom cut to your desired specifications. When you initiate the order for Brian Gavin to custom cut a diamond to the size, clarity, and color that you seek, we will source the material and begin the process. Assuming that the material necessary to cut the diamond is readily available, the timeframe is usually about 3 weeks. 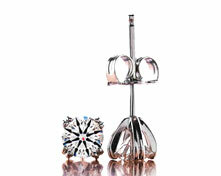 Obviously, the diamond you order will be cut to the specifications for the Brian Gavin Signature collection. You may elect to have the diamond cut to the higher degree of optical precision exhibited by Black by Brian Gavin diamonds for a slight premium. A minimum deposit of “X” is required at the time the order is initiated. We will provide you with all the usual videos of the diamond under various lighting conditions when the diamond returns from being graded by the American Gem Society Laboratory. • Order from Existing Inventory. • Preorder from the Factory. Thus, you may initiate the order for your custom cut Brian Gavin Signature or Black by Brian Gavin Diamond with the peace of mind of knowing that you will receive exactly what you’re looking for. You can also enjoy that confident feeling of knowing that the super ideal cut diamonds produced by Brian Gavin exhibit the highest volume of light return and sparkle factor. Imagine the look on her face when you present her with a diamond that was cut specifically for her!